Photography can be a lucrative career, whether you are a full-time photographer or are simply looking to make some extra money on the side. People with good photography skills are in demand, and many customers will eagerly pay for quality photos of their families, pets or even their vehicles. Besides having the equipment and talent, you will need a few other supplies. 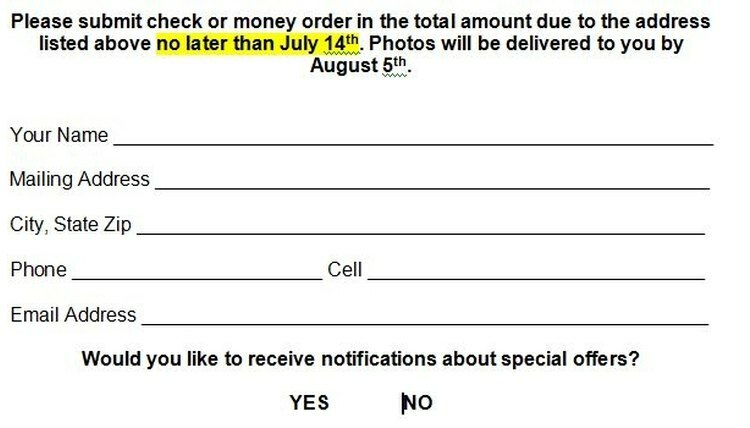 For instance, you will need an order form so customers can select photography packages. Start the document with an address block containing your name or business name, phone number, address and other details such as Web and email addresses. If you have a logo or use a fancy font, use it on the form for a unified feeling with the rest of your paperwork and envelopes. 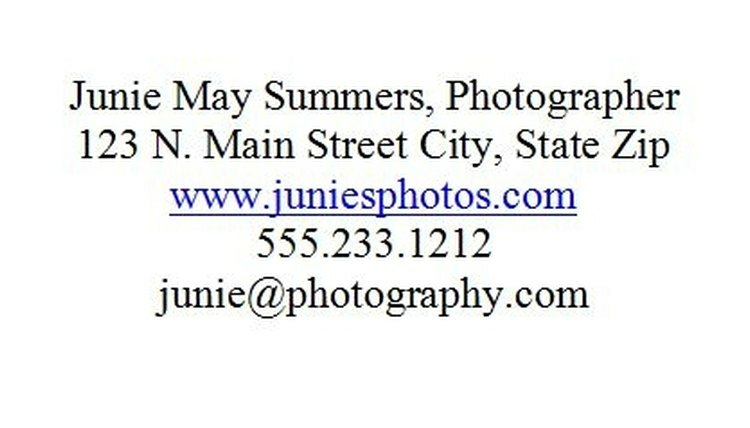 Type "Photography Order Form" at the top of the page beneath your contact information. Insert a table with enough cells for all of your different package options onto the order form. Type the different options into the table cells. 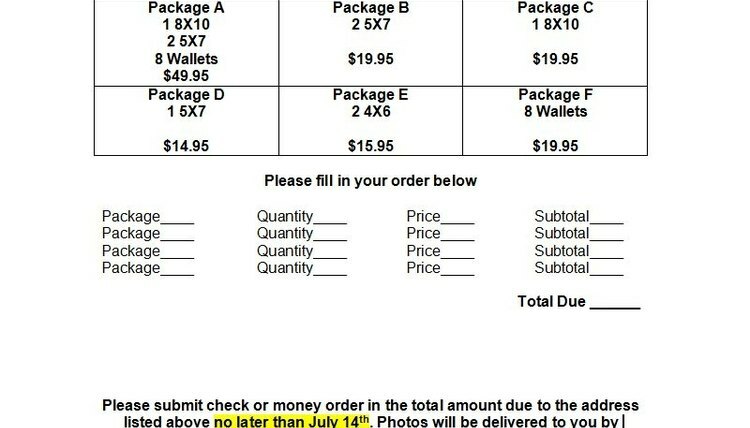 Include the package name, number of photos and their sizes, and the price of the package. If you have options for some of the packages, such as air-brushing, use an asterisk and add the information, including price, under the chart. Be sure to add a box to check for that option. If you provide "add-ons" to the packages (extra photos for ordering certain packages), create another table and mark the options along with which packages they can add on to. 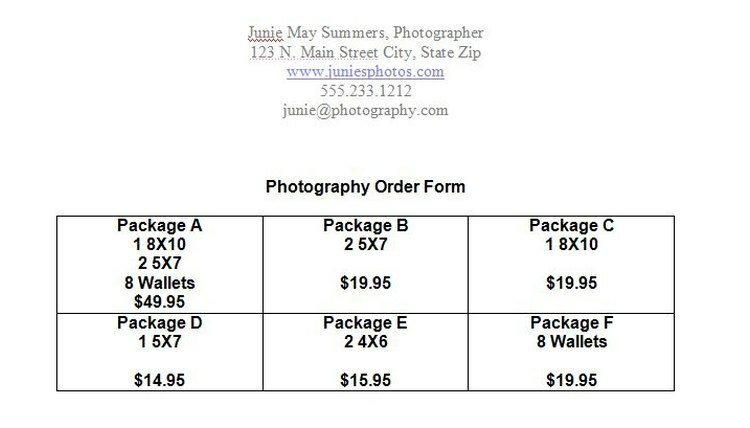 Provide instructions on how the order form should be completed, as well as a place to fill in photography package orders and their prices. Provide details, such as the date order forms must be received, types of payment accepted and where to send payment and photography order forms. If sales tax is required, note that as well. Add spaces at the bottom of the order form for photography clients to list their name, address, phone number and other contact information. Print the completed order forms on your computer printer. For a more professional look, use quality paper stock and color ink. Goss, Tricia. 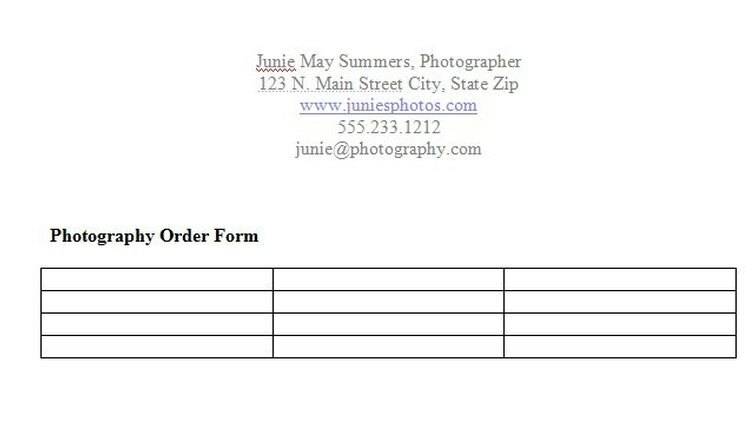 "How to Create a Photography Order Form." , https://careertrend.com/how-6170795-create-photography-order-form.html. 05 July 2017.